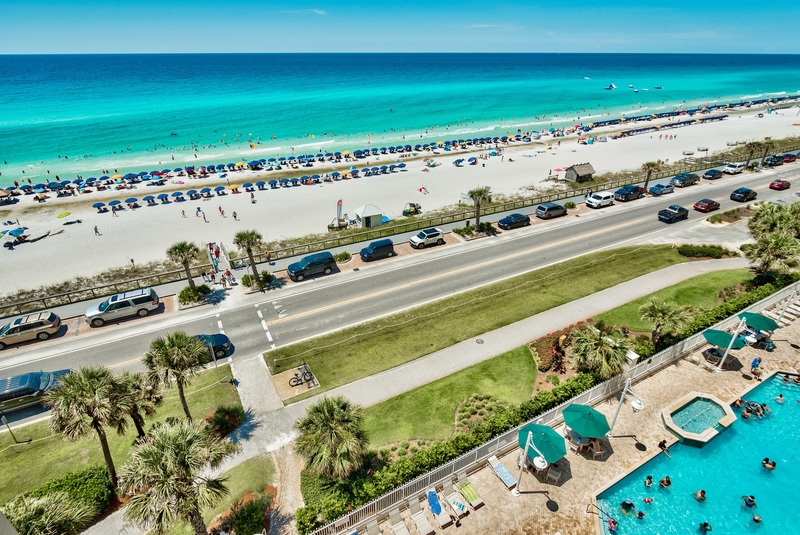 Majestic Sun 510A is a stunning modern Gulf view beach condo in Destin, FL at Seascape Resort located directly across from the beach with breathtaking views from the private balcony and all common areas. Unwind in the evening on the balcony and watch the sunset over the horizon from the fifth floor or enjoy a cup of coffee in the morning. With this rental, you are provided with two beach chairs and an umbrella in your condo that you can take to the beach, in lieu of spending $40 a day using the local beach service operator. For added convenience, our office is onsite, on the ground floor of the B building in Majestic Sun should you need anything. Upon entering this two bedroom, two bathroom beach condo, you will find a comfortable living area where you can admire the beauty of the Gulf or watch the HDTV. The sleeper sofa in the living area can comfortably sleep up to two guest. The kitchen features stainless steel appliances, a keurig machine, and is fully equipped with everything you would need to prepare a home cooked meal. The dining area and can seat up to six comfortably. Enjoy meals with beautiful views of the Gulf that the Emerald Coast has to offer! The master king suite offers an HDTV and private bath. The second bedroom has two twin beds, an HDTV and attached bath. This unit conveniently offers a laundry room and sleeps a total of six. "Linda, thank you so much for feedback! Here at Destin Palms Vacations we strive to help our guests experience the very best of the Emerald Coast. We look forward to welcoming you back to Majestic Sun again soon in the near future! See you at the beach! Destin Palms Management"